OhGizmo! Review: The FitBit Ultra | OhGizmo! By David Ponce on 10/17/11 • Leave a comment! It goes without saying that getting fit and leading a healthy lifestyle is hard, not only physically but also psychologically. Staying motivated is probably the most difficult aspect of it, so every little bit of help counts. 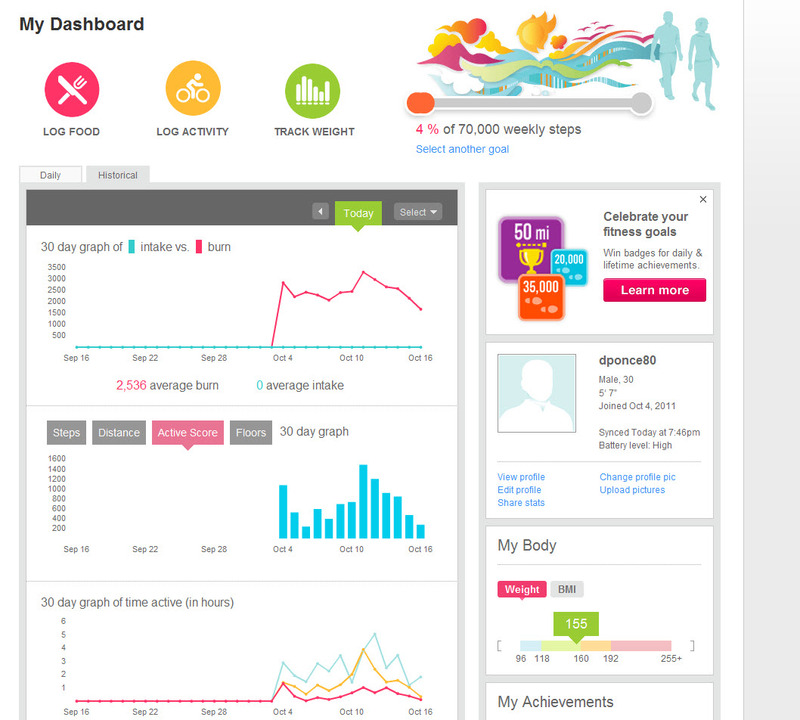 For us geeks, something like the Fitbit Ultra is great since it gives us an easy way to track and graph how we’re doing. It’s a tiny device that you attach to your clothing and which logs your every movement: how many steps you take, how many floors you climb, even how soundly you sleep. It then beams all this information to a server and packages the data in ways that make it fun and interesting and more importantly, useful. I’ve been using the device for the past week or so and have come away fairly impressed. For all the details, hit the jump. 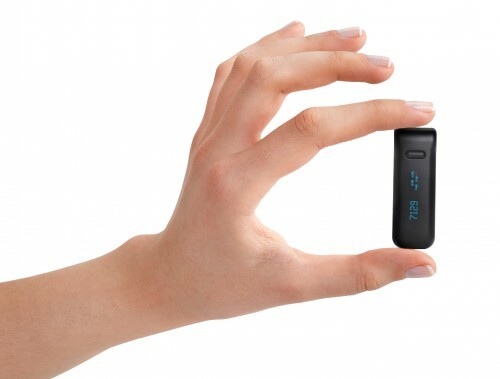 The Fitbit is appropriately small: about the size of an average thumb but flatter. It’s in the shape of a “U” so that it can clip onto your clothing but it also comes with a separate holster should your belt be too thick, etc. It is very light (11.34 grams) and it’s easy to forget you’re even wearing it. Battery life is excellent as it appears to be able to work for about 3 days without a charge. There is only one button on it, and the display dims when not in use. The one button is used for cycling through the various things it tracks, namely: number of steps taken that day, number of floors climbed, number of calories burned, distance traveled and overall activity level (displayed as a plant of varying length). It contains a precision 3-axis accelerometer and altimeter. 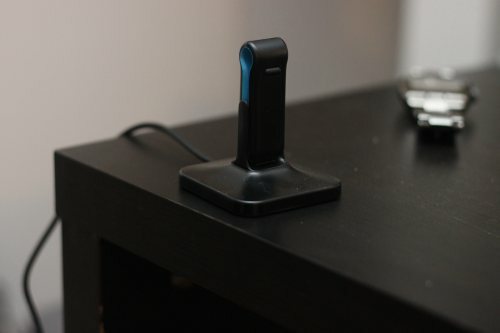 The base station connects to your computer via USB and consists of a hidden Bluetooth receptor and a small plastic tab that the Fitbit clips onto for charging. The uploading of data is done automatically, wirelessly, whenever you’re in range; it’s not necessary to dock the Fitbit for this purpose. If you are away from your computer for an extended period of time, it will store up to 7 days of data in its memory. When you start using the Fitbit, you have to do an initial setup. It’s a straightforward process where you enter your gender, age and weight and create an account. Once this is done you will have access to a tremendous amount of things that you can do with the data the Fitbit gathers. For one, it will graph your activity daily and provide you with incredible granularity when manipulating the ways in which you view it. For instance you can pick any particular day and see a breakdown of calories burned, steps taken and floors climbed every 5 minutes! In the picture above you can see that I burned 37 calories between 5:00pm and 5:05pm on Friday October 14 (click to enlarge). You are also awarded badges as a way to help you stay motivated. This is similar to what Foursquare and other services do, turning a mundane activity into a game of sorts. Badges I’ve earned so far include walking 20,000 steps in a day, climbing 25 floors in a day and walking 50 miles since tracking began. 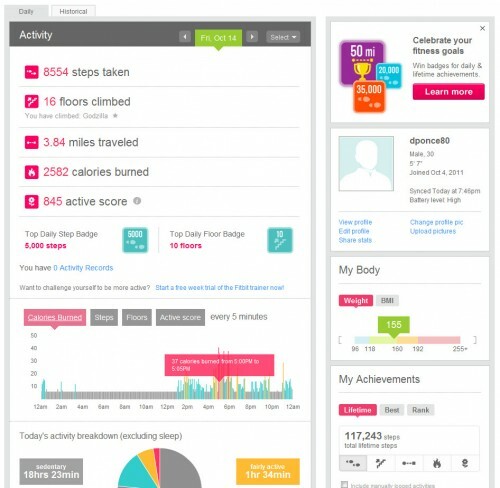 What’s more, you can compare your progress to your friend’s and that of the entire Fitbit community. This introduces a competitive aspect to staying fit and helps make the tedious a little more fun. The Fitbit service is quite comprehensive and immensely useful. But it can also be time consuming. You are provided with the ability to enter all the foods you eat and track calorie intake. 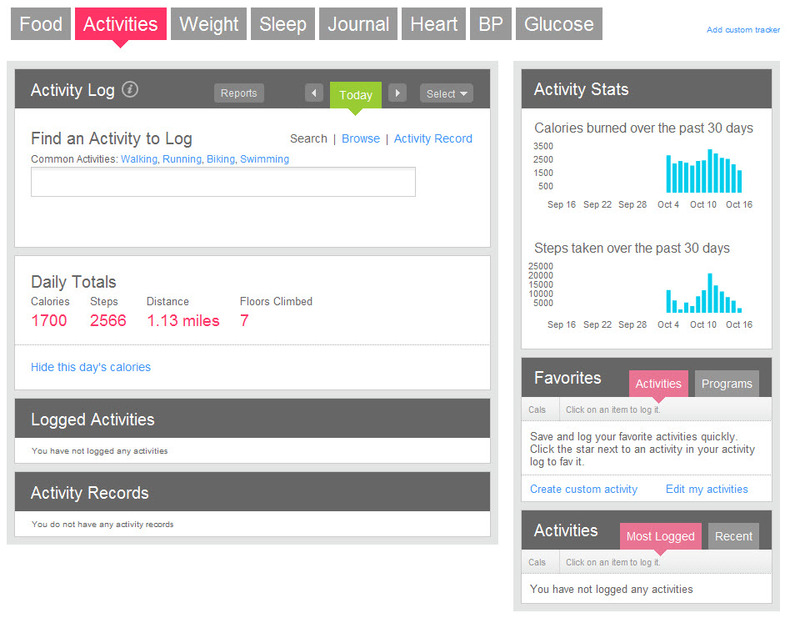 You can also track your weight, your mood, your heart rate, blood pressure, glucose levels, and keep a journal. Of course entering all this data is done manually as the only automatic entry is the one from the Fitbit device itself. This takes time and quite frankly, I never used it. Finally, you can keep an eye on how well you sleep. There’s a soft wristband included with a pouch for the Fitbit. Put it into “sleep mode” and it will tell you how often you were awake and how long you slept. 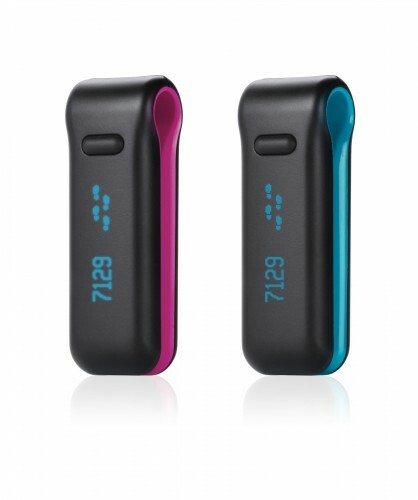 There’s no question the Fitbit adds a geeky, and useful dimension to staying fit. To be able to get feedback on ones activity level in such a compelling and engaging way goes a long way towards keeping you moving. You might take the stairs instead of the elevator, or walk the three blocks to the convenience store instead of taking the car. It’s easy to become complacent and not notice how little you actually move. Fitbit however will gladly show you your activity flatline and push you to outdo yourself. It goes without saying that there needs to be a desire to get fit in the first place, but given that, this little gadget gives you a new array of tools to help you in that quest. The Fitbit’s strength is that it’s completely automated: wear it and forget it. But the data entry in the dashboard, aside from that directly related to wearing the device, is not. This is a small weakness with the whole thing. I would have liked, for example, to see integration with the Withings scale which also automates the process of logging and tracking your weight. But for $99, you get plenty of features and access to a great service that will undeniably make your efforts at staying fit a little bit more fun. If you have questions, have at it in the comments.